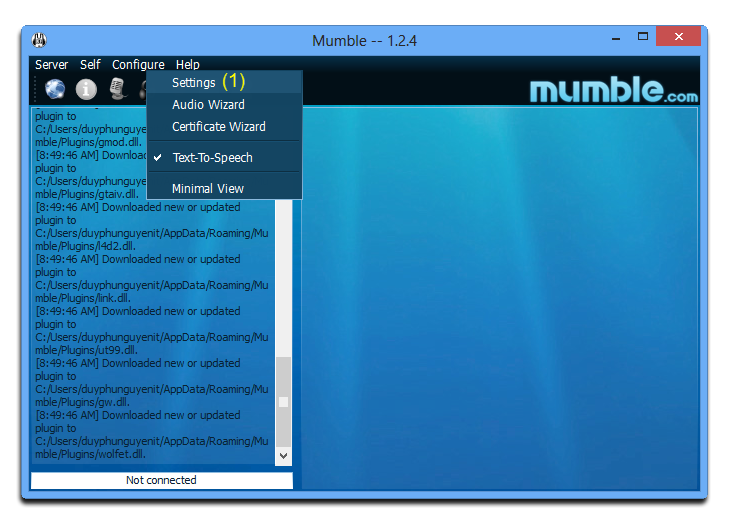 Mumble is a voice chat application for groups. While it can be used for any kind of activity, it is primarily intended for gaming. It can be compared to programs like Ventrilo or TeamSpeak. People tend to simplify things, so when they talk about Mumble they either talk about "Mumble" the client application or about "Mumble & Murmur" the whole voice chat application suite. 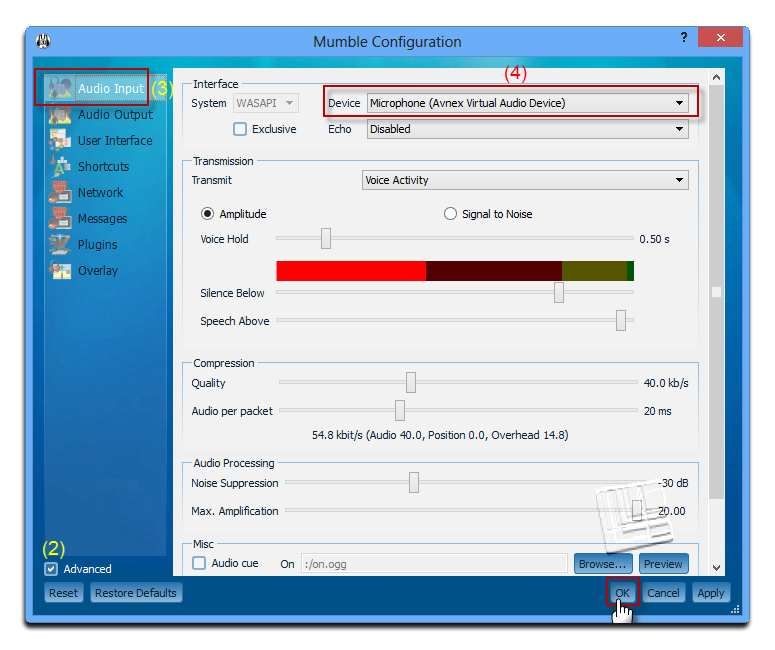 In this tutorial, we will guide you through the way to set up Voice Changer Software 8.0 Diamond (VCSD8.0) to automatically change voice for online voice communication on Mumble. - On Voice Changer Software 8.0 Diamond main panel, click Preferences to open the Preferences window. In the Preferences window, we will change Hook mode to Virtual Audio Driver mode. - Check Virtual driver Mode (1). - Click the OK button (2) to apply the new settings and close the Preferences window. 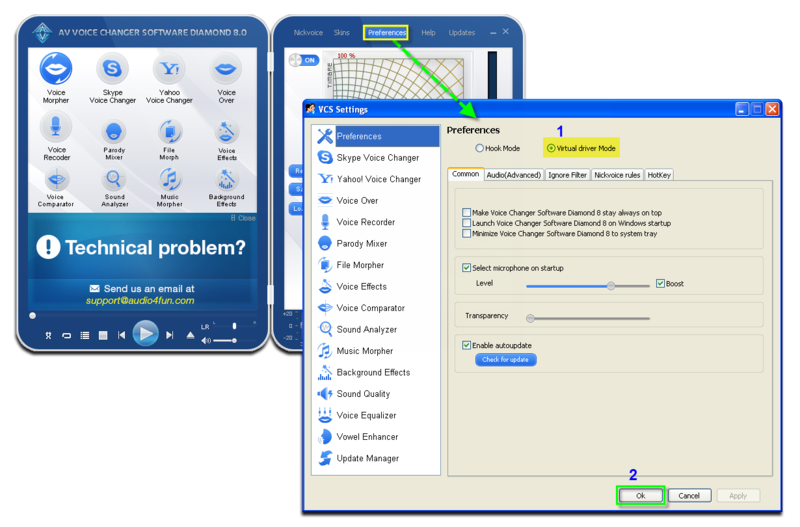 Open Voice Changer Software Diamond 8.0, choose the morphing effects for your voice, and make adjustments until you are satisfied with the output voice. Click to learn how to change voice using Voice Morpher feature. >> Turn your voice into Orcs voice - World of Warcraft. >> Or make it sound like voice of the Darth Vader’s voice. - Go to Configure menu. - Select Settings (1) command. - On Mumble configuration window, check in Advanced checkbox (2). - Choose Audio Input (3). - In Device, select Microphone (Avnex Virtual Audio Device) (4). - Click OK to apply settings. Now, you can start voice chatting on Mumble. The morphing settings for your voice will be applied automatically. Note: While VCS Virtual Audio Drivers is being set as the audio driver for Mumble do not turn off Voice Changer Software Diamond 8.0 when voice chat via Mumble. If you don’t want to use Voice Changer Software Diamond 8.0, change the audio settings of Mumble back to normal audio source.